How can businesses leverage facebook today, in the next 10 minutes with very less resources. If you run events (offline or online) you are in luck. 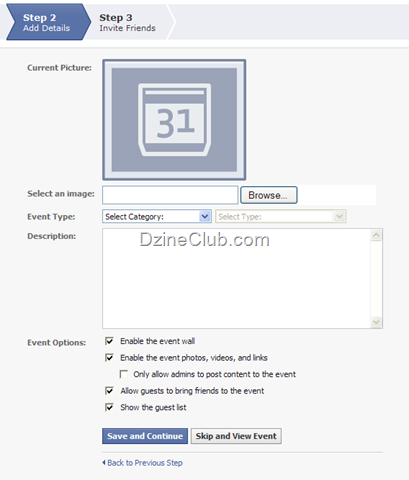 One of the things facebook does very well and the reason why a lot of people use it for is event management. You should however use other channels as well for better response, however if it’s a personal services event and all of your contacts are on facebook already, you could potentially use facebook just your event invites. 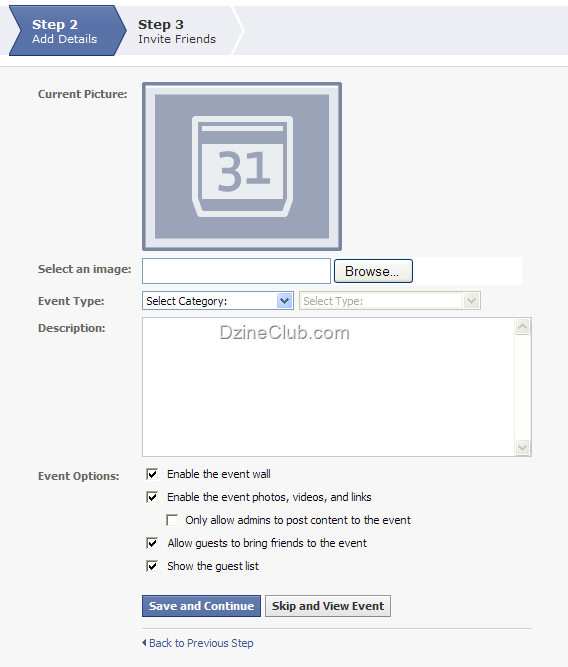 So how do you set up and event in your facebook business page? Click on the plus button next to the tabs and select events. This will add Events as a tab. All of your fans can now find your events under the events tab. It will now ask you to create an event if you don’t already have one. Enter Details of the Event. You can add a street address if you like, select the times and click on Create Event. Leave the default settings as is. If you select Meetings, then you should get a good fit of business events. Click on Publish to publish it to your home page. 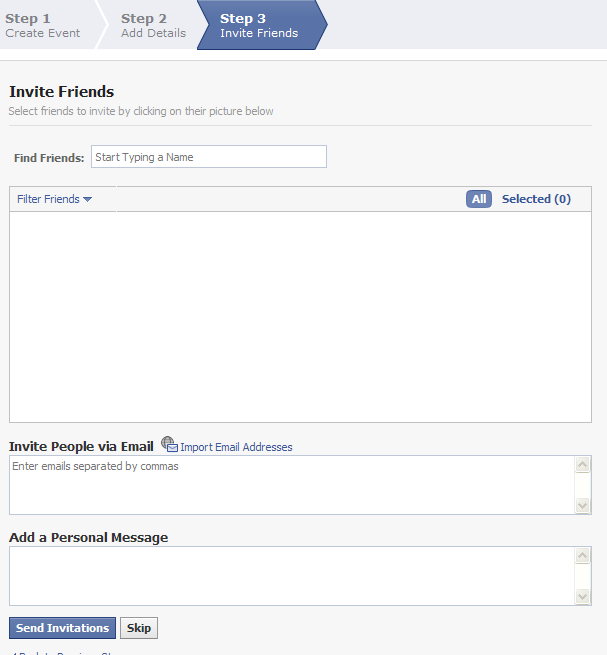 Facebook has traditionally been viewed as a personal social networking tool by many businesses. The perception for some companies is that it exposes public lives and public information to your business contacts. Obviously no one wants that. Facebook over time has evolved into a very good business platform. It is a bit of work and hard to leverage some features of facebook from a business perspective but some features are done in 5 minutes and businesses can leverage those advantages almost immediately. Over the next few weeks we will look at scenarios where you can leverage these functionalities for your business. The first one in the series is using facebook events to lift attendance to your online/offline events. We will endeavor to update this guide over the next week, so if you are a client who is getting this implemented in the next week, bookmark this page to get the details. If you are looking to use wordpress or wanting a new website with a blog that you can manage yourself, drop us a line at info@dzineclub.com Our team can send you a portfolio of wordpress websites that we have done for our clients in Australia. Unless you’ve been living under a rock for a last ten years, you probably know what Google Adwords is. If you have been living under a rock, welcome to the wonderful world of Google. Google Adwords is the advertising product for Google. Using Adwords you can run ads for your business in Google Search Engine and Google’s Advertising network. Putting up Ads is free, however if someone clicks on your ad, you will get charged a fee. The process of putting up your ad on a Search Engine like Google, Yahoo, Bing is called Search Engine Marketing (SEM) and the way you get charged per click is called Pay Per Click (PPC). Businesses use Google Adwords to advertise their products, improve their brand awareness and to get on the front page of Google (if they can’t get there by SEO alone). From an advertising perspective, the front page of Google is the most valuable space in the internet. It’s also fairly easy to set up your own Search Engine Marketing (SEM) or Pay Per Click(PPC) Campaigns. So how do you start? First let’s set up your account. Now Google will give you a choice of either assigning an existing Google Account for Adwords or creating a new one. If you already use an email address to access other Google Services (Gmail, Google AdSense, Google Analytics etc) click on this radio button and select “I’d like to use my existing Google Account for Adwords”. Then enter your account email and password to log in. Fill out your existing email address and set up your password. Google will now send you a account verification email to your existing email. Log into your existing email. You should have an email from Google Adwords, open it and click on the verification link to verify your account. Once verified, Google will ask you to add a mobile number to your account. We recommend you do this to make sure your account is more secure. How do I improve my listings? The more pages you have, the bigger you look and have more options of changing titles on those pages to target Search Engines. If you have a page, that is longer than 2 pages, break it down. Find out any local businesses that compliment your business and link to their website and ask them to link back to you. What’s even better is that if they put a little blurb around your business so that visitors to their site already have an idea about what you do. This will also look good from a Search Engine like Google perspective. Make sure you do not over do this or you might actually lose your listing. Think of a niche topic around your business and start a blog. Start putting down your thoughts and your product/service information on the blog. Make it more informative that product-based for best results. Start putting a bit of money on Search Engine Marketing. Start a Google Adwords account and start out with $100 budget for a month and see how you go. Please note that your site needs to look good compared to other sites for you to get any leads. Do a search on Google and view the pages to see how other competitors are working. Because doing all these things take time and in some cases money, you need to make sure that you are tracking all your efforts to make sure that you are getting results back. We recommend using Google Analytics to track to see if you are getting more visitors to the site because of these efforts. Now with time, we have decided to make it easier for those clients and enable optimization and resizing feature in the image gallery. You can now use the CMS itself to resize your photos that you have imported from your camera and make them web-ready. If you are using DzineCMS to make changes to the SEO and Content of your sites, here are some instructions on how to resize images using DzineCMS itself. You can also use a variety of photo effects. Do you currently have a website but no content editing capabilities? DzineCMS can be a low cost but effective solution that can allow you to make changes to your text, images and SEO content. Contact us at info@dzineclub.com for a demo and to find out how you can implement it for your website.